If you are die-hard music lover, then definitely there are bunch of bands in your must see list. For the dark music fans, I would advise to double check the list, to be sure Sisters of Mercy is in it. There are many reasons to see and hear them live. And one of them is this nice shiver going through your skin, when you hear time polished songs as “Flood II”, “First and Last and Always” or “Temple of Love” live, served by bass-baritone voice of the frontman Andrew Eldritch. So for my surprise, warning – it is my first The Sisters of Mercy gig (hopefully, not the last one), the concert at O2 ABC Glasgow on this rare sunny Scottish day was for Sisters, and Sisters only. No supporting bands, opening acts, warming up – it doesn't matter how would you call bands, trying to get people in the right mood for the headliners. Doors of the venue opened at 7 pm, confusingly two queues were lined up in the front of the O2 ABC. This mystery was quickly figured out, when many The Sisters of Mercy fans lined up in one queue, leaving small group of people to come in through other doors for another show in the small hall of the O2 ABC. A little giggling and greetings for fellow fans “to the right side of the queue” and now long black line of people slowly moved inside. And because of my earlier mentioned fact about no other bands in the show, nobody was in a hurry. People slowly coming in, getting beer, chatting, wondering around and buying merch. Hour and a half of glam rock and heavy metal in the background disappeared and fumes from the front of the stage spread out to the hall. Lights out, more fumes and finally guys one by one, appearing on the stage, welcomed by warm applause. 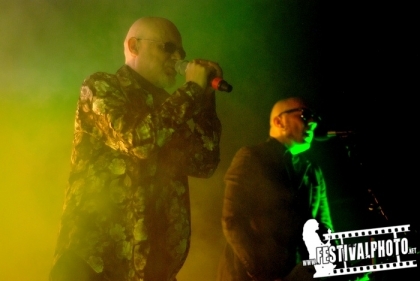 Chris Catalyst, Ben Christo and finally – Andrew Eldritch himself. More fumes, more lights, and fumes again and everything disappeared in the thick mist. First accords and with growing energy “More” loudly burst out. Show began! It immediately forced some fans to sing and get into it. More than hour and half (almost two hours) setlist was great pick of the songs to begin with old, polished tracks from all the three studio albums (“Floodland”, “First And Last And Always”, “Vision Thing”), more rare tracks, which was never released on any album like “Crash And Burn”, “Arms” and instrumental “Top Nite Out” and songs, which could be found on the compilation albums. Band came back for two encores, which pleased the audience a lot and completely lost their minds during “Lucretia, My Reflection, “Vision Thing” and waved for quite a long, hard good-bye with “Temple of Love”. Three guys on the stage might seem not enough for somebody, but The Sisters of Mercy make it perfect: while vocalist and band soul Andrew was appearing and disappearing the fumes, leaving his memorable voice behind, both guitarist was taking the front of the stage and engaging the audience – it all looked quite complete. Despite all these wonderful things, there was one bitter part of all of that. Although O2 ABC usually is the venue with a good sound, this time somebody didn't make the job done right. From time to time poor sound for one or another guitar or too silent vocals was quite the mood spoiler. 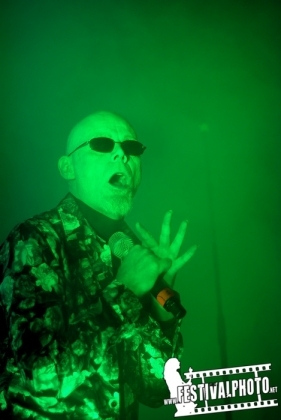 The Sisters of Mercy are the long living English legends, who is a pleasure to hear and see. They might have a long rocky road to go through but it always worth it: crowded venue in the center in Glasgow showed that perfectly. English accents in the middle of the crowd, German and Polish tongues there and here and of course, happy Scottish souls on the top of that – all these people came to see The Sisters of Mercy only.